OK, this isn’t exactly new, but it’s so cool! If “regular” tattoos just aren’t doing the trick for you anymore maybe you’re ready to upgrade to functional, “smart tattoos”. DuoSkin tattoos were developed by researchers at MIT Media Lab in collaboration with Microsoft Research. They not only look cool but also do cool things. DuoSkins are temporary tattoos that function exactly like the store bought temporary tattoos you’ve probably used a bunch of times. You can apply them with a wet sponge and they last up to two to three days. DuoSkin is a fabrication process that enables anyone to create customized functional devices that can be attached directly on their skin. Using gold metal leaf, a material that is cheap, skin-friendly, and robust for everyday wear, we demonstrate three types of on-skin interfaces: sensing touch input, displaying output, and wireless communication. 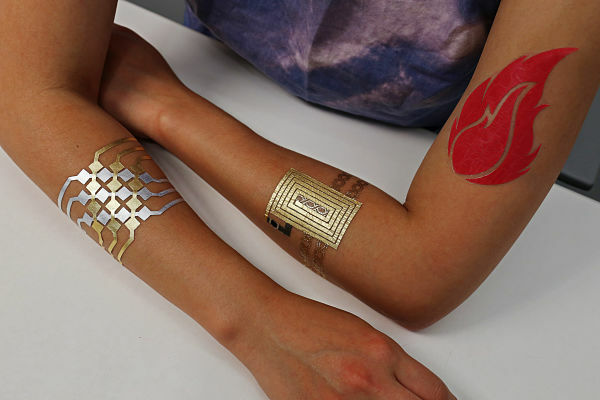 DuoSkin draws from the aesthetics found in metallic jewelry-like temporary tattoos to create on-skin devices which resemble jewelry. DuoSkin devices enable users to control their mobile devices, display information, and store information on their skin while serving as a statement of personal style. We believe that in the future, on-skin electronics will no longer be black-boxed and mystified; instead, they will converge towards the user-friendliness, extensibility, and aesthetics of body decorations, forming a DuoSkin integrated to the extent that it has seemingly disappeared. Step 1: (a) Sketching skin circuitry with graphic design software. 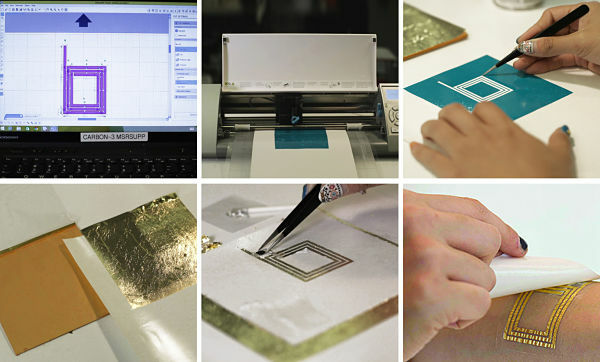 Step 2: (b) Fabrication, which includes (c) creating stencils of the circuitry, (d) applying gold leaf as the conductive material, and (e) mounting electronics. Step 3: (f) After completing the circuitry, we apply the DuoSkin device to the user’s skin through water-transfer. The other fun part about this project is it’s actually fairly simple to create at home. The materials are affordable (under CHF 10!) and easily accessible. Paul already had most of the pieces in the Fab Lab in Geneva. Listen to the podcast for tips on how to make these at home. The future is now! Check out more from the MIT Media Lab on their Vimeo page.